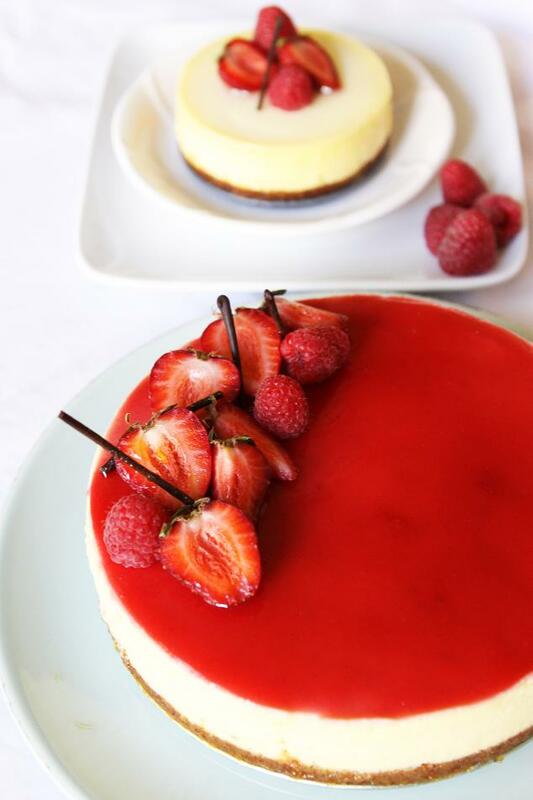 Gourmet Baking: Vanilla Bean Cheesecake with Jellied Cream, Raspberry Gelée, Yogurt Sherbet, and a Giveaway! Vanilla Bean Cheesecake with Jellied Cream, Raspberry Gelée, Yogurt Sherbet, and a Giveaway! Did I tell you how much I LOVE Summer (often enough?)? 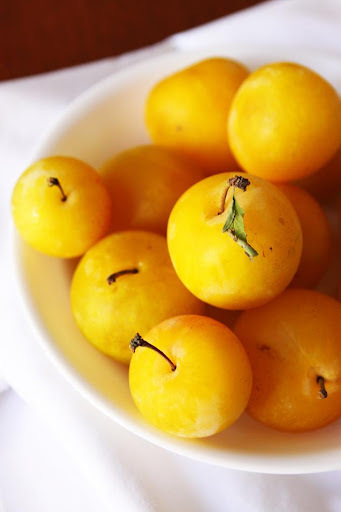 I went to a different farmers' market than the one we usually go to two weeks ago, and to my surprise, I found some lovely yellow plums and it was bursting with sweet juices on my first bite. I fell in love on the spot and bought a bag full of them, not sure what to do with them but I bought loads of them! Plums usually don't have that much flavor, it's basically sweet juice, so not sure if it would be any good to turn them into something. I was planning to make a simple tart with it, maybe accompanied by a good vanilla bean ice cream, but I found myself eating it everyday out of hand, it was too good to be turned into something. I've also been taking advantage of the corn season and make corn fritters from fresh corn. My little tomato garden is also producing so many different tomatoes with different colors and sizes, so exciting, not to mention the basil too. At this time of the year, you can be sure that my fridge is full with so many different varieties of fruits. Soon, it's my freezer that will be loaded with sweet juicy fruits :). Do you know that I cook too :D? My friends and I watched "Julie and Julia" a few months ago and we've been trying to imitate the way Julia talks. I've always loved movies about food and ever since we watched that movie, we can't stop talking about when are we going to make the famous beef bourguignon, the last and famous dish on that movie and there I was in search of the perfect cast iron pan (you see, when they said "we", they actually meant me). When I was in college, I had a dream that someday, I would own my own le creuset pan (for real!) and cook so many dishes with it including the beef bourguignon, it is somewhat a weird wish for someone who doesn't major in culinary, but chemical engineering instead and of course it didn't come to reality as it was pretty costly for a college girl, especially when one book costs around $200. It's funny how find myself baking and posting more and more dessert at the time when I am at one of the busiest moments lately. Every Summer, I notice that instead of becoming more relaxed, I seem to be in a very fast pace of life, it's like I'm in race with the time all the time, it's one of those time when you wish that there are 48 hrs in a day. There are so many birthdays in Summer and if you're like me, you're more excited making birthday cakes with those lovely fruits compared to the Winter time, plus the ice cream season, the stone fruits, the berries, the sun, it's like even if I bake everyday, I still wouldn't be able to make every item on my list. I was pondering for inspiration of what I should make on the weekend a few weeks ago. Planning is the key since time is so valuable so everything has to be planned out first to have a success baking time :). I was looking at my fridge and I saw some leftover cream cheese that needs to be used up pretty fast. I like to buy big blocks of cream cheese whenever I go to Costco, but I can never use it in one go. Once it's opened, you need to use the remainder soon before it starts to go bad. It is actually perfect this time to have cream cheese leftover as I have been wanting to try one of the cheesecake recipe from Alain Ducasse's book. I've been referencing recipes from this book for the last few posts in my blog and I fall in love with this book all over again. If you look closely to the recipes, a lot of them are actually manageable to make, it just has a very long step and components, which can be a turnoff. There's this one recipe for cheesecake under plated dessert. There's nothing too fancy about the recipe, it looks pretty standard to me except that it uses grounded pate sucree as the crust because apparently they don't have graham crackers in France. The thing that caught my eye was the amount of time it needed to go into the oven. 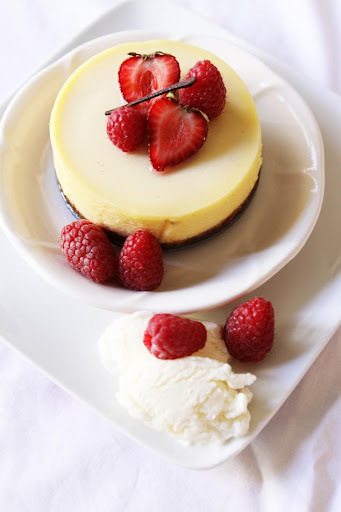 The recipe requires the cheesecake to be baked at a very low temperature for 3 whole hours!!! Yup, I couldn't believe it at first, but the picture next to it showed a slice of cheesecake with what looks like a very smooth and creamy texture. To be honest, I'm not a fan of the thick and dense NY style cheesecake. I can probably eat a small spoonful but that's about it. When I saw how creamy and soft the cheesecake looked in the picture, I was sold. Besides, I'm a little curious how French top pastry chef interprets this classic American dessert. I don't have the amount of cream cheese required to bake a full cheesecake, so I re-sized them according to the amount that I have and it's perfect for 8" round, which is more than enough for me. He paired the cheesecake with yogurt sherbet and berry compote. I decided to skip the berry compote and just topped the cheesecake with raspberry glaze and served it with fresh berries. The top is actually a raspberry jelly that I planned to make a pattern on top of the cheesecake with but it wasn't 100% successful, the pattern smudges out and doesn't look so cool anymore, so I just covered the entire surface with it and applied some clear glaze to get the shiny effect. As I mentioned in the previous post, San Jose has been pretty cold for Summer this year. The temperature just stays around 70-75F during the day and mid 40's-low 50's in the morning and at night. I was hesitant at first turning on the oven for 3 hrs in a Summer day but I guess this is the perfect timing because it didn't feel hot at all. The outside temp was nice, the house is also nice and cool at 75 F even with the oven turned on. It seems like forever waiting the cheesecake to be baked for 3 hours! I was so tempted to take a nap at the second hour but I didn't. I even thought that the cheesecake will never ever set at 195F because it still looked wet after the second hour. But in the end, it sets beautifully, so creamy without being dry or dense at all. The yogurt sherbet was also delicious! 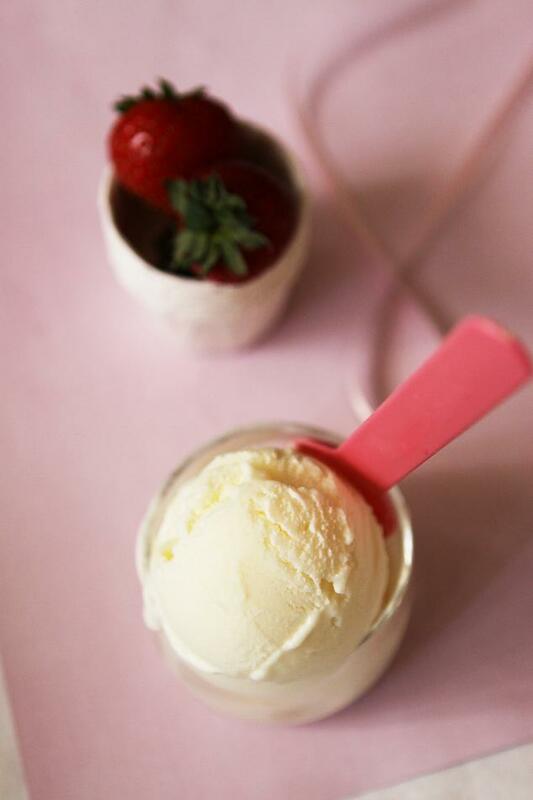 It tastes exactly like the original flavor of my favorite frozen yogurt place when I tried it soft-serve straight from the ice cream maker, and it was pretty simple to make too. Too bad I wasn't making a lot of it, or I would have eat it straight with my spoon. Now, onto the giveaway. The CSN store, which has 250+ different sites, is graciously offering a $40 gift certificate that you can spend anywhere in their hundreds of store. They have HUGE selections of outdoor and kitchen stuff that you would absolutely love. An idea would be to use to it toward the le creuset pan that I've always wanted :). The giveaway is open to US and Canada residents only. The giveaway will open for a week until Tuesday, August 17th 2010 and I will pick one winner randomly on the following day. To make the crust: if you're using slivered almond, pulse it in a food processor until fine, if using powder, just combine it with the rest of the ingredients. Press the mixture in the bottom of a springform pan (I lined mine with parchment paper too, but you don't have to). Bake the crust on 350F for about 10-15minutes until the crust is slightly brown. Let cool. 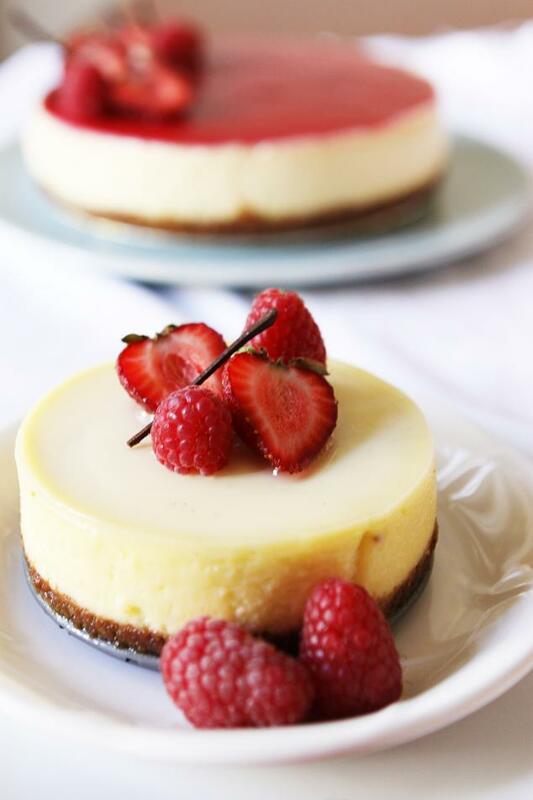 To make the cheesecake filling: combine the cream cheese, vanilla bean seeds, and the sugar and mix with paddle attachment until soft and creamy. Add the eggs and egg yolk one at a time, then add the heavy cream and flour. Pour onto the cooled (or slightly cooled) crust and bake in a waterbath for 3 hours at 194F (90C). Let cool, leave to sit in the refrigerator for 24 hours. Spread the jellied cream on top of the cheesecake and smooth out with spatula, let it set. Remove the cheesecake from the pan. If you want to make it into 9" round springform pan, use five 8-oz blocks and re-size the rest of the ingredients for the cheesecake filling and the crust accordingly. You can use the same amount of the jellied cream and the yogurt sherbet. The book uses grind tart crust to make the base crust for the cheesecake. It also suggests using regular plain graham cracker crust if you have it available, but I'm never a fan of the regular graham cracker, and I've been using this almond crust for every of my cheesecake. You can use any type of crust you want. I've been baking and baking with so many summer fruits now. And now I'm into making jams and preserves. I'm not really a bread person, but making jam is fun and satisfying. Since Lemons and Limes are so plentiful during this time of year I make Lemon and Lime squares. There usually are some made and in my freezer so I can bring them out when necessary. This is so simple, but I've been using up tomatoes and cucumbers by chopping them up with pepper/garlic salt and feta cheese, and spooning heaps on top of a warmed naan and hummus! bossacafez: Thanks! I can't stop admiring your creation on each post as well, drooling everytime. I've also been wanting to make cheesecake in a mousse ring, but I worried more about the waterbath, worried that the water will seep in since there's nothing under the crust except the foil, except maybe if I put the waterbath on the below rack and not directly with the pan. 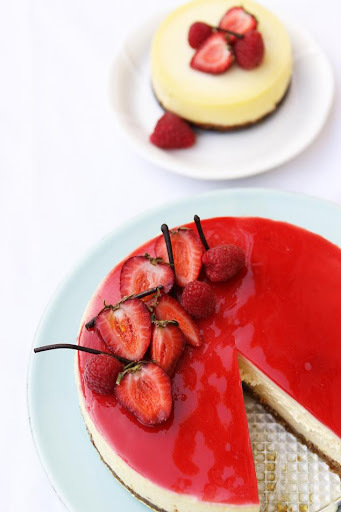 I wouldn't think it's too difficult removing the base because once you warmed up the outside (like how you would do with a mousse cake), it would be easier to remove, and with the help of the tip of a knife, it shouldn't be a big of a problem i would say. Oh and no, sadly, I am not a pastry chef, just a regular engineer who happens to love pastry :). Do ribs count as summer produce? I am the lucky brother, I got to eat half of this cheesecake. Delicious as it can be. I might want to "order" (free) from Bertha soon. Hey, I think there might be a medical term for post-delivery craving for the father, right? what creation is awaiting from your creative mind on my b-day?? I usually try to make corn fritters during the summer when the corns are sweet and cheap :) I love corn! i've eaten more tomato sandwiches than i care to admit, and the salad frequency has been increased drastically. i do love summer and all its bounty! I LOVE LOVE LOVE to munch fresh juicy red strawberries and cherries!! And you know i've been making tons of mango desserts this summer. I just got into corns lately, and I think I want to try few more recipes with them while they're still on sale. This is the first time I visited this site and I already fall in love with it! I use a lot of berries, all different kinds, to make berry crumb bars. They are so easy to make and delicious! I don't even remember how many times I have baked them this summer. 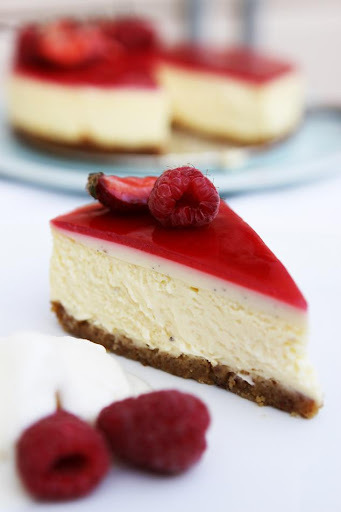 That is one PRETTY cheescake...just saw it on FG! WOW! I'm just like you with summer! I cannot get enough of it, and am constantly making fruit based desserts ... my passion is with stone fruity this summer - cherries, peaches & plums!! I did the same thing back in grad school -- baked a tiny cheesecake b/c I had not enough cream cheese. A double maple variety, very good. Best way to use summer fruit? Fresh berries on a whipped cream-topped pavlova. The perfect balance of sweet, tart and creamy. hi bertha, thx so much for the comprehensive tips :) just like to double check, your yogurt sherbet is on the cake itself directly below the gelee? i wonder if i can omit it coz i don't know where i can get the stabilizer. do u normally buy alot of chemicals/molecular stuff for yr bakes like trimoline, isomalt etc? 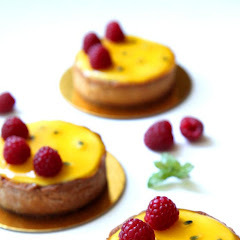 i saw this recipe for pierre herme's infiniment vanille tart that uses titanium dioxide, dunno where to get that! as for removing the cake from a mousse ring, my worry is, removing the top wouldn't be a problem, i just intend to use a blowtorch to torch the sides for easy removal but when it comes to the crust, will it get stuck? i tried once and the crust just wouldn't come off :( if only we can bake the filling & crust separately then during assembling just place the filling ontop of the crust haha. yes amazon is really cheaper! i got dorie greenspan's paris sweets for like US$17! and this alain ducasse book, yea i'm getting it nonetheless tho' i probably would shy away from plated desserts. i hv this frozen desserts book by francisco migoya (CIA) and johnny iuzzini's dessert fourplay but i haven't used it much yet. plated desserts is just too much work and too many components. plus its not like u can bring them out to share with friends, so not really feasible unless u entertain alot at home. Deeba: Yes, I saw your madness with stone fruits and cherries on your blog (in a good way) and I'm loving it! Bossacafez: no, it's not the sorbet underneat the raspberry jelly, it's the jellied cream. 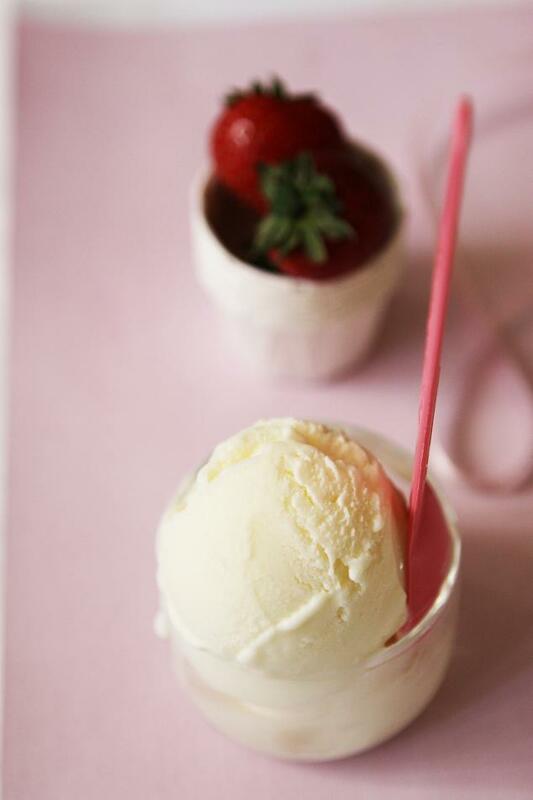 The sherbet is just an accompaniment on the side and of course you can omit it. I don't normally use chemical/molecular gastronomy stuff on my baking, it was just i've been too curious w/ recipes in this book and a lot of them uses some unusual ingredients (although this one is still somewhat normal), and luckily my baking site carries a couple of them, so yay. You can omit it if you want, I mentioned it in the previous sorbet post what the stabilizer and atomized glucose (or glucose powder) are for, so you can totally omit that ingredient. 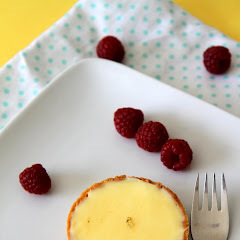 For the mini cheesecake, if you worry that much about the crust, you can line the side with parchment paper so you can just peel it off after baking and not worry about having to torch it. Me too have a couple of plated dessert books, they're real pretty but gosh I would never make anything from it. bossacafez: oopps.. sorry I forgot to mention that if you don't use the atomized glucose, you need to add more sugar. atomized glucose is only half as sweet as regular sugar. i love taking advantage of the fresh peaches in the area. I always have to make a peach crisp with ice cream! I love summer produce! I love grilled peaches. I also can't get enough of my garden veggies! I just sautee them and eat them in a wrap. Just made cheese cake too and posted it on my blog and on FG. I was so proud of the result and the photos until I saw yours. That is without a doubt the prettiest cheese cake I have ever seen. Well done. thank you! glucose powder is actually pretty common on the supermarket shelves (brand is glucolin) but i'm not sure if its the same thing as atomized glucose. sorry, i just hv one last question - i don't see the recipe for the raspberry gelee on yr entry so i reckon i can just use my own? These look delicious! Gorgeous photos too! This looks fabulous!! 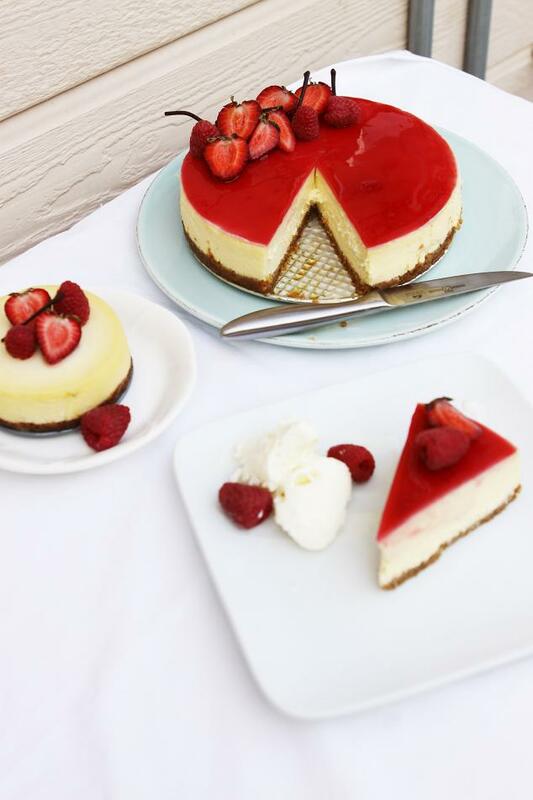 One of the most drool-worthy cheesecakes I've seen! 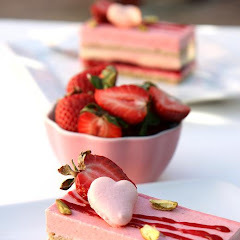 With berries, I love to bake sponge cakes with fruity fillings. And with stone fruits, I love making pies! I learned how to make sorbet with summer fruits. Yummy! I would love to make a lemon curd filled cake-but haven't worked up the guts to try it yet. YOur cheesecake looks amazing!!!!! Your cheesecake is beautiful! We've been eating a lot of sweet corn, and I love baking with summer fruits. bossacafez: atomized glucose is the same as glucose powder, at least according to the internet :). for the raspberry jelly, I don't have a recipe for it because I just mix without weighing it (it was supposed to be for decor only). you can leave it out if you want. I enjoyed summer not because the wheather but because I can get fresh fruits locally so I can do my baking experiment freely with fresh ones instead of the frozen ones. Also I'm a huge fan of corn so this time I'm in heaven eating corns in so many ways. Question: If you use the Springform pan, how do you make sure water from the waterbath doesn't leak in? Those pans tend to be quite leaky, you know. BTW, do you think the slivered almonds might have been a little unnecessary given the richness of the cream cheese and the flavor of the vanilla beans? I don't see the almonds contributing any texture or flavor to the recipe... btw, great blog. Mogit: The almond contributes to the nutty flavor that i like. you can use all graham crackers if you like. Looks so great! Thanks for sharing! Hi! I love your post and your cakes look amazing! 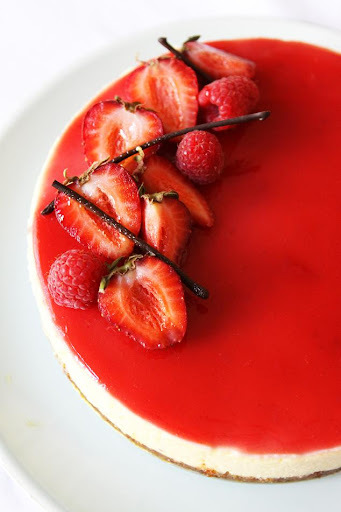 Can you tell me how you made the jellied cream and glaze? I want to try this and would like to know exactly how you made it. Thanks! yes, i made the raspberry glaze but i didnt measure it, so i don't remember the recipe. it is not part of the recipe in the book. Thank you. If mine turns out half as good as yours, I'd be happy. How long did you bake the smaller sized cheesecake for? Anonymous: I don't remember how long I baked the small cheesecake for, I usually just check and jiggle the pan. You want the edges to set but the center slightly jiggly to get the best texture. I'm just wondering, does the cheesecake (plus jellied cream) goes well with dark chocolate ganache? I'm thinking of replacing the compote with ganache but not so sure about the taste. Thank you! Nadya: Sure! Dark chocolate ganache would be great with the cheesecake!